Learn how to customize your Datablocks in the Properties Panel. 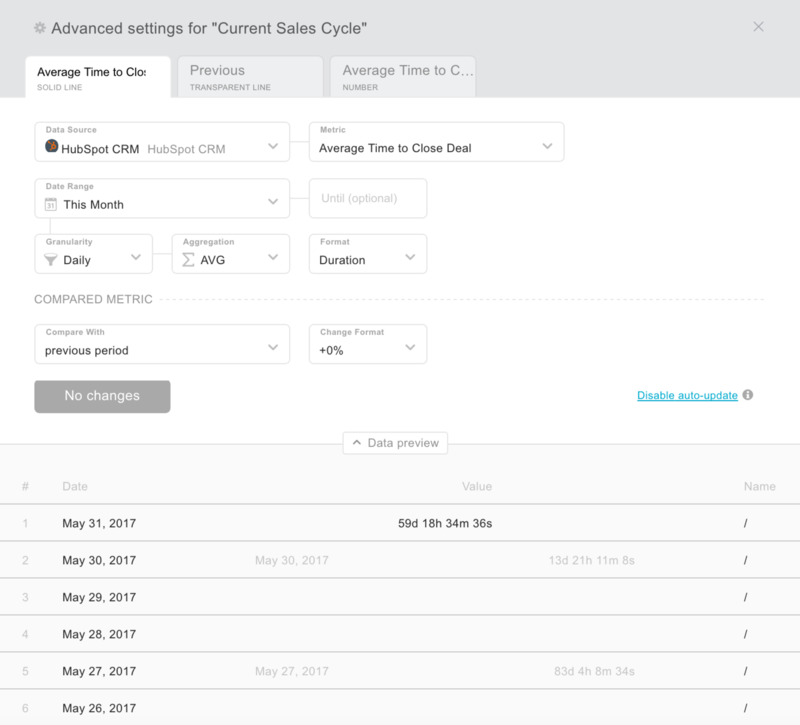 Change metrics, date ranges, comparison period, and other settings. After you click on a datablock, the properties panel will appear on the righthand side of your screen. 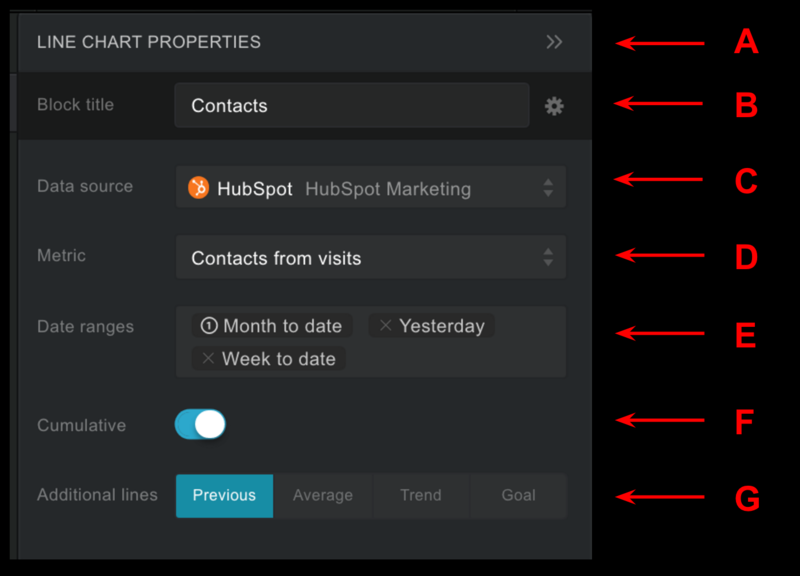 Let’s walk through the tools that make up the properties panel. Specifies what visualization type is in use. This is the name that is displayed at the top of the datablock. We typically recommend you correspond your metric name and your datablock name, however there are instances where this isn't the best practice. The block title is always customizable, so choose a name that best signifies to you what is being displayed. The gear next to the block title will open the "Advanced Settings" window. This is where you can use some additional tools to make your datablock even more impactful. One of the most important features of this window is the "Compare to" option, that allows you to compare to the previous period, same period last year, etc. 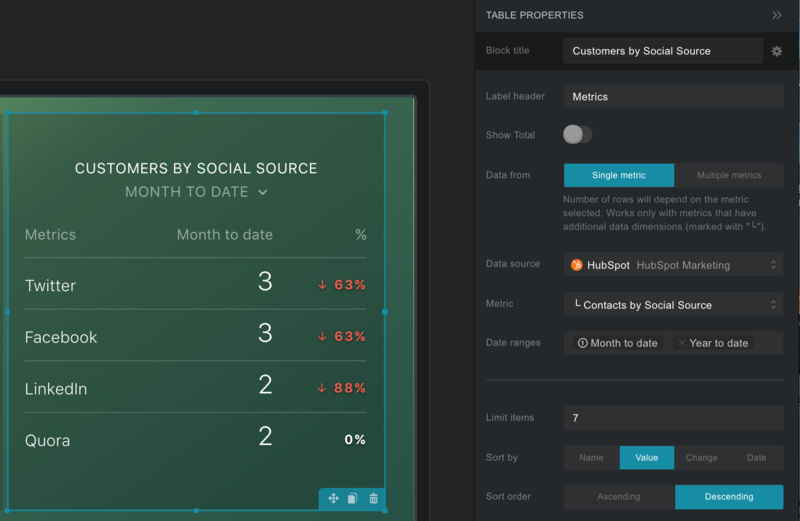 The ability to choose the data source is arguably the most important functionality of the properties panel. From this dropdown list, you select where you would like to pull the data in from. Every data source you choose will pull different metrics, so it's vital that you select the appropriate data source for your reporting purposes. Since you can customized the properties panel for each datablock, you have the ability to pull data from multiple sources within the same databoard. This one's self-explanatory. Choose the metric from the previously selected data source that you would like to display in the datablock. For some visualization types & metric combinations, you may then be prompted to choose a "dimension" or "attribute." These provide a more granular look at the selected metric. Another perk of the properties panel is the ease of creating reports for multiple time periods within the same databoard. The first date range that you select (with the number 1 next to it) will be the default date range. After that, any selected range will be an "additional interval." 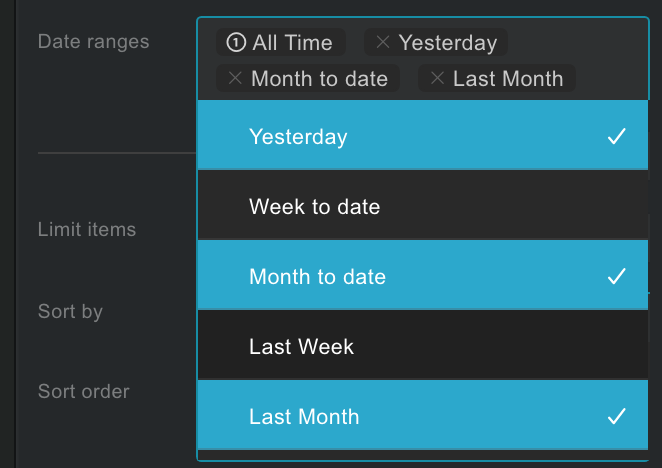 When viewing the databoard, you'll have the ability to select any of the additional date ranges you specified by the arrow next to the current interval you're viewing. Part of the significance of displaying near realtime KPIs is the fact that you can see how your progressing and how you compare to previous periods. In order to view the percentage change of your current metric as compared to the previous period, click the "Show Change" toggle. 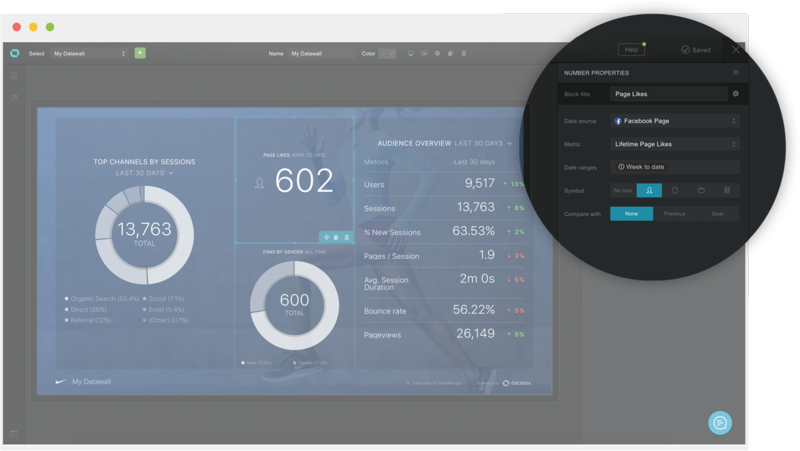 This will look different depending on which visualization type you're using, but you'll be able to get a good understanding of how your current performance compares to that of the previous time period. 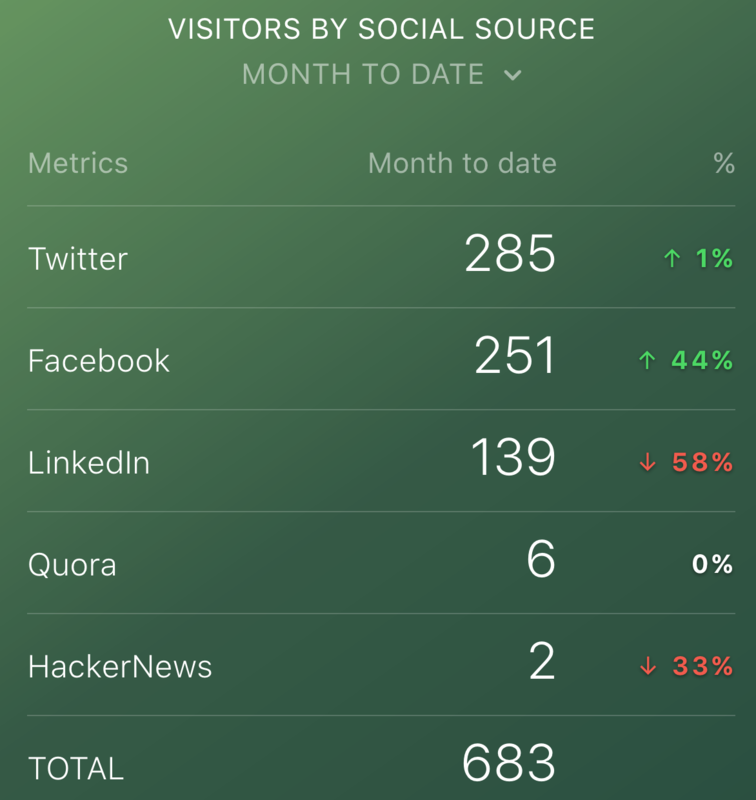 For certain visualization types, you'll have the ability to choose if you want the cumulative metric displayed. This display changes depending on the visualization type, so play around with it and see if it works for your reporting purposes. Similarly to the section above, this will vary for different visualization types. For the line chart in particular, you can choose to display different lines on the same graph. In the image below, you can see that the shaded in region represents the "Previous" trend. As you can see, the properties panel in the designer is one of the most important tools offered. It gives you the ability to customize individual datablocks, and ultimately build a comprehensive report. 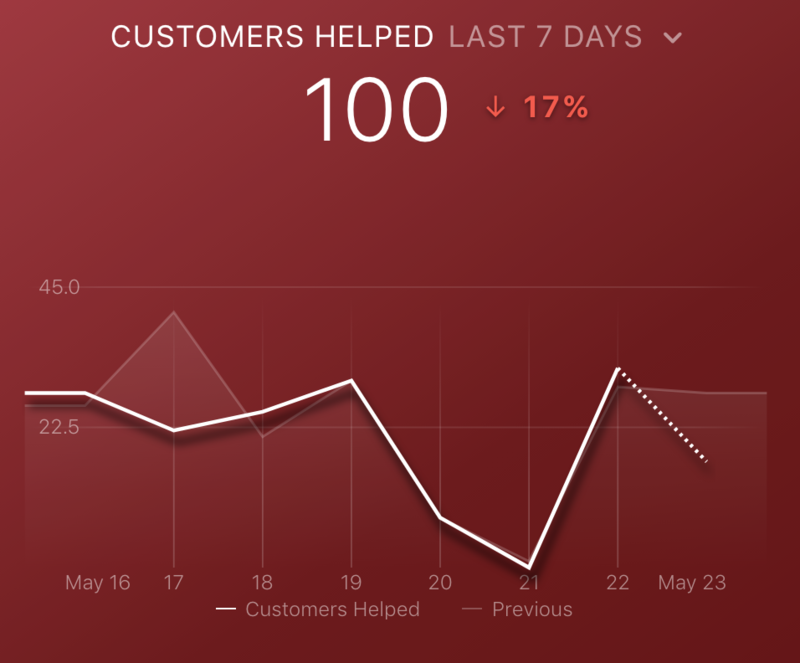 Different visualization types give you different options, so take some time to play around and become comfortable with this feature so that you can create the reports you've always wanted! How is data captured in a specific date range? What is a Datablock and Databoard?